We have the pleasure to present you our new product – HS Schuco ThermoSlide lift and sidle doors. This is an unbeatable combination of beautiful design and comfort in your house. Triple-insulated threshold prevents the occurrence of the so called “cold areas” within the floor area. Thanks to guide rail systems and sliding gaskets, sliding the HS doors is effortless, and also the doors offer high durability and tightness. 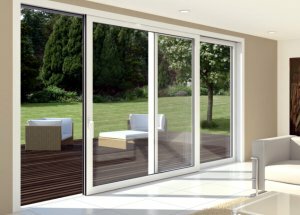 The door leaf is equipped with a lock which makes it possible to set the door in the trickle ventilation position without the risk of burglary. The most distinctive feature of the HS door is its size. Its cross-section is 219 mm thick. It is possible to apply wide packs of warm complex panes. 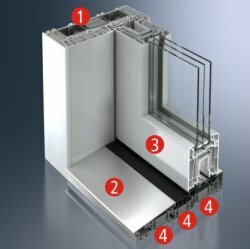 The frame and threshold are equipped with special thermal breaks and hence, the ThermoSlide HS door meets the highest energy requirements of passive houses. Possible option with a flat threshold causing no access barriers. ThermoSlide HS is the best combination of state-of-the-art technology with comfort, security and modern design. With our product you can afford a bit of luxury in your own house.